Analogue hygrometers for indoor use (barometer, thermometer, hygrometer) are made of beech and aluminium. 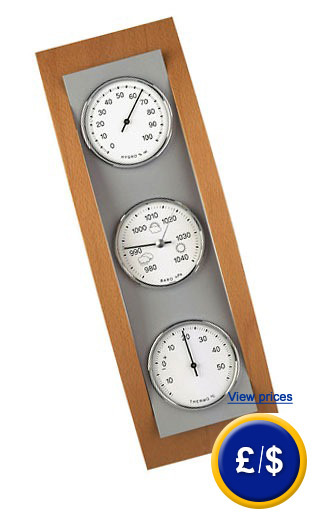 An analogue hygrometer in modern design has 3 easy to read, round displays. Should you have any further questions regarding our analogue Hygrometer Domatic Beech / Aluminium, take a look at the technical specifications or contact us: UK customers +44(0) 23 809 870 30 / US customers +1-410-387-7703. An overview of all weather stations can be found here: weather stations. Our technicians and engineers will be happy to help you with this analogue hygrometer and all other products in the field of measuring instruments, regulation and control and scales.